People try–sometimes VERY hard–to heal others. Loved ones, strangers, friends, acquaintances. It doesn’t matter. And there is beauty in that, the way humans reach out and care about each other, even if that caring at times comes across as overbearing or otherwise onerous. But right here and right now, with the energy what it is and the sky what it is and everything else what it is, the healing must begin at home/dixiblog/domains/afoolsjourney.com/public_html. 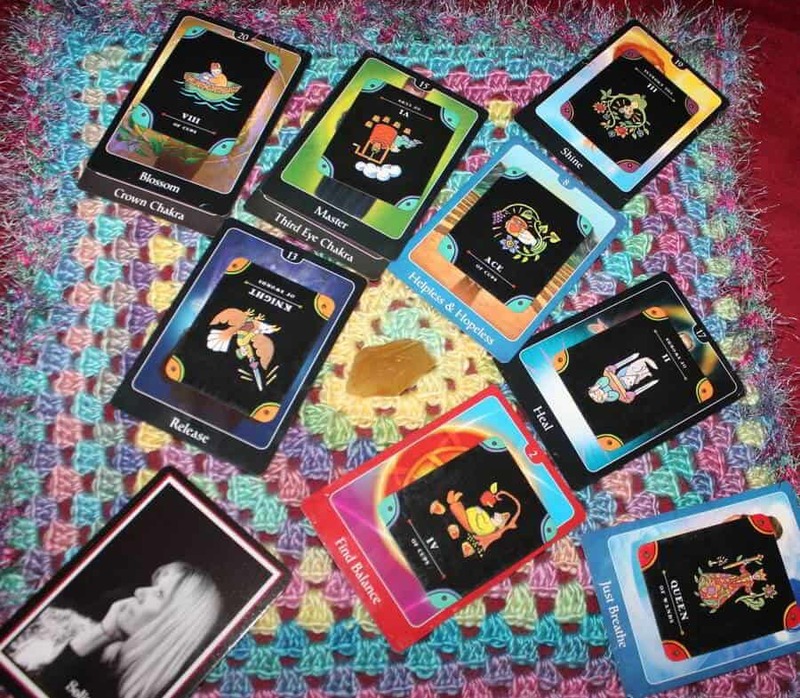 Tarot Cups are very well represented this week–maybe a little too well represented–with a smattering of Swords and just a dash of Wands making appearances. That tells me it’s gonna be a squishy week! Now, it can be emotional-all-over-the-place squishy, or you can use the very same energy to tap into magical, mystical forms of expression. I’m opting for the latter. In other words, talk to the flowers and trees and little critters. Ask your body what it wants from you! Imagine sending your “roots” deep into the earth and connecting to the solid, stabilizing energy of our world. Bless your food and infuse it with good health. Thank your house for keeping you safe and thank your car for moving you to and fro. Thank your feet for holding you up and thank plants for sharing oxygen and beauty to brighten your day. Say your prayers and do your magic spells and just allow these feelings to reach crescendo and then RELEASE. This is like blowing up your balloon nice and big and then, letting it go! That will burn through the squish while letting it serve you at the same time. Because otherwise? You’d probably get stuck crying it off and that’s no fun. This week’s forecast is literally chock full of indicators to look within, focus on yourself, and take charge of your own space on every level. So do that! Monday, Blossom/Crown Chakra – Eight of Cups: Let it go to blossom AND to improve your spirit connection. Purge the old, be it physical, concrete items or emotional (and hence, energetic). Hint: the emotional and energetic release comes very swiftly from taking physical action, or purging physical items. Something my friend Aliza said recently about the Eight of Cups struck me. The usual rendition has someone walking away from upright cups and she reminded me, those cups remain intact even though you’re walking away from them. They are not spilled or destroyed. So here, the idea is that you need NOT continuing to worry about anything that’s not yours. Problems that aren’t yours? You can let it go. Confusion, ugliness, wrongness out in the wild? Let it go! YOUR EMOTIONAL NEEDS ARE JOB 1 this week. Other people’s needs/wants/issues are just that: other people’s. Wednesday, Helpless & Hopeless – Ace of Cups: Very small feelings make very big ripples today. There’s an advantage to that fact though. Small feelings require smaller adjustments to make big changes. Discriminate over what feelings you “drink in.” Avoid negative people and unhappy litanies wherever you find them. My go-to emergency strategy for this kind of energy is a gratitude list. I know it sounds hokey but if you try it, you’ll see what I mean. Articulate what you’re grateful for and allow yourself to experience the flush that goes with feeling it, deep down. Best remedy for chasing away the hopelessness, right there! Thursday, Heal – Two of Swords rx: You didn’t have choices always, about what pain has visited. But you can still heal it. Just understand it’s not a linear, thinky-thinky kind of process. The healing doesn’t lie in weighing out the impact of injury mentally. It lies in allowing yourself to grieve, the quiet time and space. It lies in treating yourself lovingly and kindly. It lies is seeking comfort and then accepting that comfort without argument. I’m seeing this like a long walk through flower-filled paths. There isn’t thinking, “Oh, I will enjoy these flowers now. The science behind their blooms is amazing and the scents stimulate my neurons to fire in a pleasing arrangement.” You just take it in and experience it, you know? The healing doesn’t have to be deconstructed. You just allow it in! Friday, Just Breathe – Queen of Wands: Slow, deep and determined breathing will stabilize any difficulties and provide clarity and strength. The Queen of Wands is a very tough cookie and she’s on your side today! Passion, determination and incredible force of will are hence at your disposal. To access these gifts, stop, breathe and see that firely strength flowing right into your crown. Seriously! Saturday, Release – Knight of Swords rx: Stop speculating over the whys and wherefores that have gone before. Does it really matter what someone’s motivation was when they stabbed you? And is that understanding worth reliving the stabs over and over? Purging, distraction, or replacement are the tactics I’d go for. Getting rid of physical items (or electronic communications, etc.) that trigger pain. Finding other ways to engage your mind and body that you like. Or if you’re having trouble breaking free, channel the energy into creative activity. It will help! Sunday, Find Balance – Four of Cups: Today, use the power of your imagination to support you instead of sabotage. It’s un-worry time! Imagine how you might feel if your life is full and blessed and you’ve been gifted by the Universe with what you need to blossom and flourish. Imagine what the perfect balance of giving and recieving might feel like. Imagine bliss and joy filling your days and night. Daydream on that! This will ground and balance you. Overview/Advice, Shine – The Empress rx: Don’t be the world’s Mama to shine this week. Don’t be cutting the meat on someone else’s plate to help chew on their lessons. Not your job right now. Take care of the self. Digest lessons for the self. Affirmation, Solitude: “Be empty and still. Seek no company and find union with self. Observe your mental and emotional state. Right relationship with ourselves is necessary for a balance relationship with others. Solutions can be found in solitude. We are either alone or all one. Be quiet and your soul will sing.” I think I’m going to use the affirmation, “I’m at peace with myself.” But these thoughts are clearly echoing the rest of the forecast. It’s retrograde season, astrologically. Bits and pieces of the past are coming into focus and they can pack some pretty hefty punches. We deal with them by taking a step back, out of the bustle and noise, and allowing the feelings to come. They’ll wash up, over you. You just let them. You feel your feelings! You accept them and offer a safe space, full of love, for the “you” that has felt these feelings and is looking to heal the hurts of the past. Hold no judgement, for self or other. Just feel them. This allows them to do their cleansing work. And quiet, downtime and solitude is the perfect environment for this to happen. We’re all going to be feeling the old feels for a while – but now? I want to HEAL the old feels! Are you feeling the old feels?